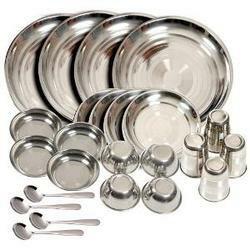 Keeping in sync with time, we are able to offer Stainless Steel Buffet Set to our patrons. Our company has gained name and fame in presenting Stainless Steel Buffet Set. 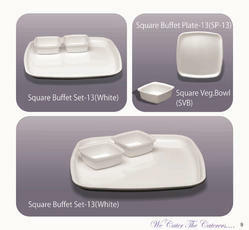 The Deluxe Apple Buffet Set offered by us is available in various shapes and sizes and is known for its elegance. It is manufactured using stainless steel and is available to clients at affordable prices. 1 Thali, 2 vati, 1 spoon, 1 square halwaplate, 1 glass. Made in SS 301, korean Steel.. Fantastic finish comparable to German quality ! New York Rectangular Chafing Dishes come with Hydraulic Mechanism and in 9 Ltrs Capacity. We can offer in Rose Gold and Gold TItanium Finishes aswell.